Alvin is a church musician and active recitalist. A native of Augusta, GA, Alvin R. Blount was educated in the public schools of Richmond County. He received his first organ lessons during college semester breaks from Michael Joyce and William Christmas, and after graduating from Tuskegee Institute (now University) with a Bachelor of Arts degree in English, he did public relations work and also taught reading in the Richmond County School System. It was during this time that he met Jamie Council Garvey, who taught him organ and encouraged him to return to school to study music. He later earned degrees from Mercer University and The University of Tennessee, Knoxville, respectively; he was an organ student of John Brock and the late Robert Parris. 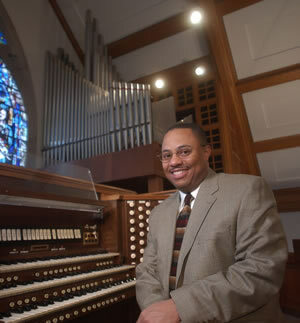 Alvin is the Past-Dean of the Augusta Chapter of the American Guild of Organists, and the Alumni Board of Directors, Townsend School of Music of Mercer University. Click the buttons above to read about my Education, Professional Experience, and Affliations, Performances, and Programs. directed the St. Mary’s choirs on two European tours: Italy(1999) and Ireland(2001). In addition to concerts, I directed the choirs in St. Peter’s Basilica on the Feast of Christ the King, celebrated by Our Holy Father, Pope John Paul II. Developed and chaired the acquisition of four additional bells to the bell tower to commemorate the centennial of the Church in 2017. 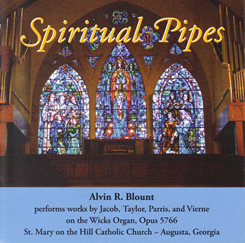 Music for Organ and Voice, Henry Hinnant, tenor and Alvin Blount, organ; St. Mary on the Hill Catholic Church, Augusta Monday, May 7, 2012, 7:00 pm. Benefit concert for Catholic Social Services, Augusta. A native of Augusta, GA, Alvin R. Blount was educated in the public schools of Richmond County. He received his first organ lessons during college semester breaks from Michael Joyce and William Christmas, and after graduating from Tuskegee Institute (now University) with a Bachelor of Arts degree in English, he did public relations work and taught reading in the Richmond County School System. It was during this time that he met Jamie Council Garvey, who taught him private organ lessons and encouraged him to return to school to study music. He later earned degrees from Mercer University and the University of Tennessee, Knoxville, respectively; he was an organ student of the late Robert Parris and John Brock. 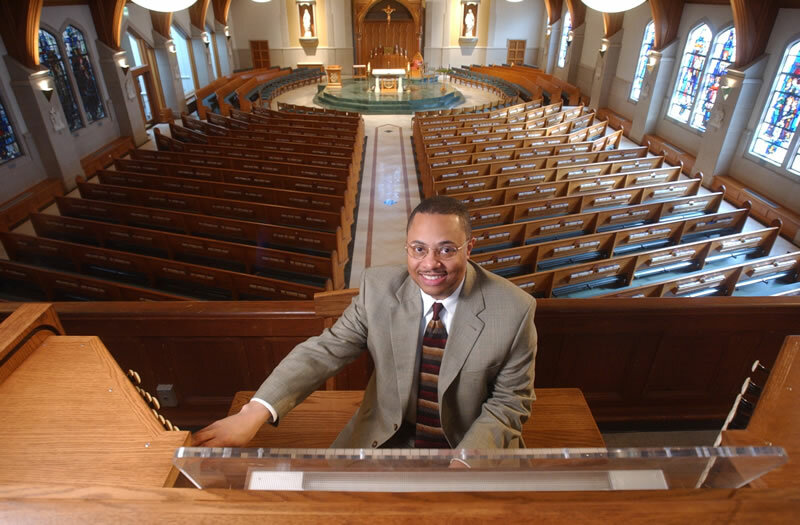 Alvin was recently appointed as the Organist and Choirmaster at Episcopal Church of the Ascension, Cartersville, GA and is organist for Holy Innocents' Episcopal Church, Atlanta, at the 6 pm Sunday Eucharist. He was Director of Music and Worship at St. Mary on the Hill Catholic Church, Augusta, from 1995-2017. It was during this time that he produced four recordings and directed the Parish and Contemporary Choirs of St. Mary’s on tours throughout the Southeastern United States and parts of Ireland and Italy, where they had the opportunity to sing in St. Peter’s Basilica on the Feast of Christ the King, celebrated by Pope John Paul II in 1999. 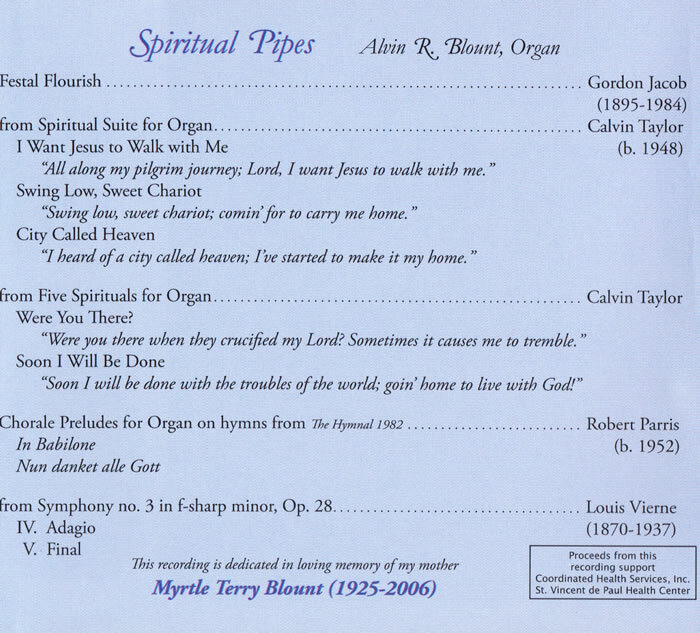 An active recitalist, his first solo recording of organ works, Spiritual Pipes, is available on compact disc. This CD is dedicated in loving memory of his mother, Myrtle Terry Blount (1925-2006). He has performed solo recitals across the United States, including National City Christian Church (Washington, DC), Saint Thomas Church Fifth Ave (New York), The Cathedral of St. Philip (Atlanta), Concerts With A Cause St. John United Methodist Church (Augusta), and Master Arts Series Church Street United Methodist Church, (Knoxville). A past-Dean of the Augusta Chapter of the American Guild of Organists, Alvin is also a member of the Executive Board of the Atlanta Chapter, American Guild of the Organists, and the Board of Directors for the Sewanee Church Music Conference. © Alvin Blount. All Rights Reserved.